Now that you have read through the ten bar breakout strategy, we will now show you how you can change some of the elements to suit you and the asset that you are trading. Below you will find a number of ways in which you can vary the strategy. The following variations are mechanical, i.e. 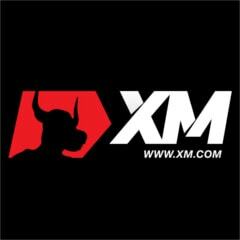 you do not need to use discretion or your own judgement to trade using them. The higher the period of the moving average, the slower it will respond to a change in trend direction. The lower the period of the moving average, the more quickly it will respond to a change in trend direction. 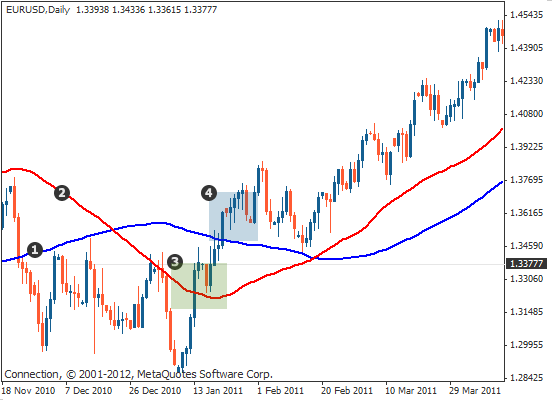 You can use different types of moving averages and with different periods. 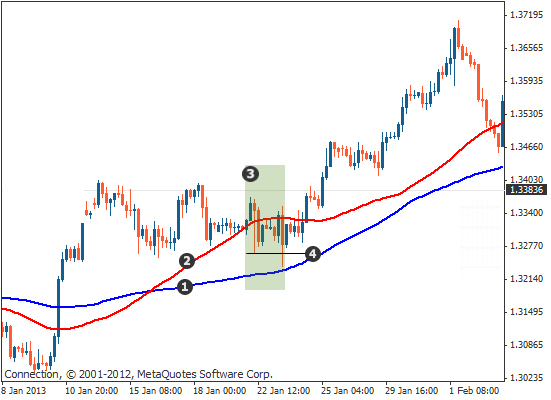 The moving average, in this strategy, is used as a filter so that you are trading in the direction of the overall trend. The higher the period of the moving average, the longer it takes to react to a change in price direction. The basic rules, outlined in this module, uses an 89 period simple moving average. 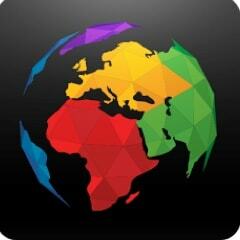 This means that it takes into account the last 89 periods – or 89 days – when used on a daily time frame. If you then change the moving average settings to, say, 50 periods, then the moving average calculations will only take into account the last 50 days. This means that the moving average will show a change in direction more quickly with a lower setting than one with 89 periods. The moving average shown as 1, is an 89 period moving average and 2 is a 50 period moving average. You can see in the chart that the price goes above the 50 period moving average, shown in the green shaded area at 3, more quickly than the 89 period moving average, shown in the blue shaded area at 4. The 50 period moving average detects the change in trend direction more quickly than the 89 period moving average. This means that using a lower period moving average can potentially allow you to trade in the right direction more quickly after a trend change. 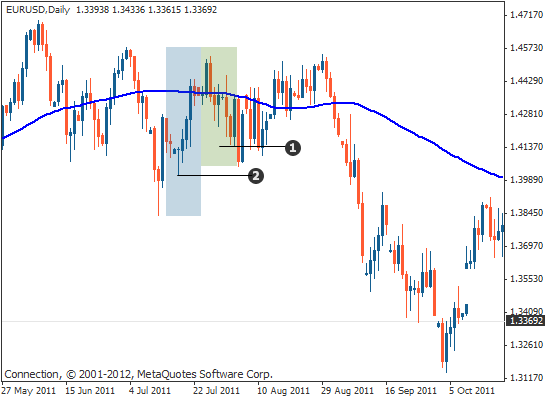 A higher period moving average is more likely to keep you trading in the overall direction and filter out false trades. A lower period moving average may detect a trend change, when it is actually a temporary correction in the overall direction. Although there is an advantage to detecting the trend change more quickly, it is not always beneficial. Using a higher period moving average, as opposed to a lower period moving average, would mean that the price may stay above the moving average in an uptrend (or below in a downtrend), even while the price is temporarily correcting. This means that the higher period moving average would keep you trading in the overall direction, whereas using a lower period moving average may result in you entering with a false signal. 1 is an 89 period moving average and 2 is a 50 period moving average. In the green shaded area at 3, you can see 10 candles that you may use to determine an entry. In this area, you can also see that the price dips below the 50 period moving average, but not the 89 period moving average. According to the 50 period moving average, only short trades should be taken and as you can see, the price breaks below the low within the ten bar period, shown by the black line at 4. This would have resulted in a short trade, but ultimately a losing trade. However, according to the 89 period moving average, you should only take long trades – the candles are above the 89 period moving average. This means that you would not have entered into a short trade if you used the 89 period moving average at this point, but would have eventually taken a long trade in the preceding move up. The higher period moving average ultimately keeps you trading in the direction of the trend for a longer period of time. You will need to decide how you would like to use varying moving averages and what is best for you. Expanding the amount of periods to define the breakout of the highest and lowest price, can result in less false trades when the price enters into a ranging market. You can also define the amount of bars that you use for the breakout. The current rules take the highest and the lowest price within the last ten periods (or ten days) to define the entry and the exit. However, you can use any number of period. By lengthening the period, you have a wider range of candles that will define the breakout. By using more candles to define the breakout period, you are likely to have a higher or a lower price that you use for the breakout. This means that potentially, you could have a better trading signal because if the price has entered into a ranging market, then you would be more likely to stay out of the trade until the price has broken out of the range. The green shaded area represents 10 bars and the low is shown by the black line at 1. As the next candle opens and forms, it would have gone below this line, entering you into a short trade. The price subsequently moves back up and this would have resulted in a losing trade. The green and blue shaded areas put together represent 20 periods. You can see from the black line shown at 2 that this is the low of the last 20 bars. This means that had you used a 20 bar breakout, the short trade would not have executed and saved you from a losing trade. The only drawback to using more periods is that the exit point for your trade would also be a higher high or a lower low and so you are likely to have to give back more of a profit. If a variation produces less profit, take into consideration that the variation may have produced less trades and so you may have a more reliable system, although you have not made as much profit. You should understand that if you expand the number of bars that you use for a breakout, then this is likely to result in less trades. If you expand the number of bars and it generates less profit overall, then you must take into account how many trade this generated as the profit per trade may actually be higher. You effectively give up more trades, and potentially less profit, for reliability. Whenever you change an element of a strategy, you must test and monitor the strategy in a trading journal. There are of course many other variations that you can use in conjunction with these, or any other strategy. This lesson was to show you that you can ultimately take the ten bar breakout strategy and tweak it to suit your own style of trading. You can, of course, just use the rules defined. The most important thing to consider, when changing any aspect of a strategy, is that you carry out sufficient testing and monitoring of the strategy. Before you take any variation of a strategy to a live account, you must make sure that you have backtested it, to show that it has worked in the past. You must constantly monitor the strategy when trading live and record all trades in a journal. You can also use software to backtest your strategy over a period of time. However we would strongly encourage you to always record your trades in a trading journal and monitor the strategy live, because past performance is not indicative of future results.